DDOT has proposed the first phase of major service changes to DC Circulator under a long-term Transit Development Plan that include overhauls of two routes and some additional service. WASHINGTON — Significant changes to DC Circulator routes could come in the new year. The District Department of Transportation has proposed the first phase of major service changes under a long-term Transit Development Plan that include overhauls of two routes and some additional service. Beginning in April, the Union Station-Navy Yard Metro route would be largely eliminated and replaced by a new route. The new route would run from L’Enfant Plaza to Waterfront to Eastern Market along 7th Street SW, M Street and Barracks Row. That route would get permanent Saturday service and new Sunday hours. 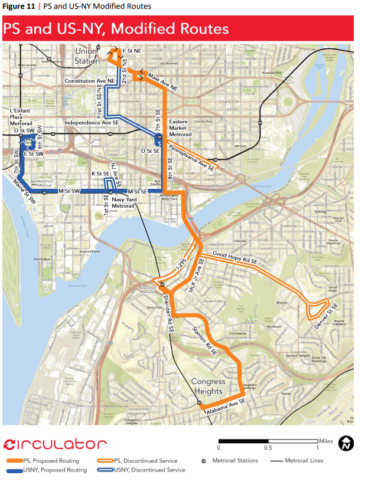 The Potomac Ave. Metro-Skyland route would also be largely scrapped and replaced by a new route between Union Station and Congress Heights Metro via Barracks Row and Downtown Anacostia. That new route would also run 7 a.m. to 9 p.m. Saturdays and Sundays. The change, which will require two additional buses in service, would end service along Good Hope Rd. between Alabama Ave. SE and Martin Luther King Jr. Ave. SE, along I-295 between Howard Rd. SE and 11th St. SE, and along Pennsylvania Ave. SE between Potomac Ave. Metro and Eastern Market. The new route would create new service along Stanton Rd. SE and 8th Street NE/SE. The Georgetown-Union Station route would get extended hours to run its entire stretch until 3 a.m. Friday and Saturday nights. Other proposed changes include permanently starting service on several routes at 6 a.m. rather than 7 a.m., and eliminating some stops along the Georgetown-Union Station route that are close to others to speed up service. DDOT also plans to eliminate the unlimited DC Circulator paper bus pass, but would continue to accept the $17.50 weekly regional bus pass. Regular Circulator fares would remain $1. As part of the changes, DDOT promised Capitol Hill visitors and employees that it would work with Metro to boost the number of rush-hour trips on the 97 bus to replace trips lost due to the cancellation of the Union Station-Navy Yard Circulator route. Riders can comment on the proposals online or by email through Jan. 19, or at a public hearing from 7 p.m. to 9 p.m. Jan. 4 at The Miracle Theater. DDOT believes the changes are needed because existing routes often get stuck in traffic or overlap significantly with Metrobus routes. Long-term plans do suggest dedicated bus lanes as a possible solution along with better parking enforcement. The DC Circulator’s midrange plans call for other changes including shifting the Georgetown-Union Station route’s stop at Union Station out from the garage to the front of the station closer to the Capitol and an extension of the Dupont Circle-Georgetown-Rosslyn route to the U Street Metro. Long-term, D.C. is still trying to develop its own maintenance facility for the buses to allow for greater flexibility.